(MENAFN - GetNews) When quality matters, and you want to make sure that you buy the best beads on the market, just shop with Crystal Findings Inc. Philadelphia, Pennsylvania - March 12, 2019 - Jewelers who are looking for high-quality Swarovski crystal beads don't need to look any further than Crystal Findings Inc. Not only do they carry a wide selection of different beads for you to choose from, but they make it incredibly easy to find the perfect beads for your needs and bring your jewelry to life. One of the benefits of buying Swarovski crystal beads online from Crystal Findings Inc. is that they offer a large selection, so you will be able to choose from different sizes, shapes, and colors of beads. Specialty fancy shapes can often be difficult to find, but not anymore. With shapes including modular, graphic, crystal disc, keystone, aquiline, and cosmic, as well as traditional bead shapes, you will easily be able to find exactly what you need. Additionally, choose from several different cuts so that the jewelry you make is truly one of a kind. Another great benefit of shopping with Crystal Findings Inc. is that you can order the right number of beads for your needs. Whether you are shopping for a single showstopper that will be the final part of your gorgeous jewelry or whether you need to buy in bulk, you can easily get the right amount for your needs, which means that you don't have to worry about overspending when you shop. Whether you are looking for small beads or larger Swarovski crystal pendant beads , when you shop with Crystal Findings, Inc., you can rest assured that you will have access to some of the highest quality beads in the world. Thanks to a commitment to quality and customer service, every bead that you buy will be perfectly chosen for your needs and will be inspected to ensure that it meets your expectations. When you're ready to buy the best beads on the market, it's time to shop with Crystal Findings, Inc. Crystal Findings Inc. has been in business since 1996, and has since been the #1 choice for stores, crafters, and hobbyists in the United States! They are one of the largest bead suppliers in the United States, with a massive collection of over 12,000 gold filled, sterling silver, and Swarovski crystal beads. Visit https://www.crystalfindings.com/ to know more. 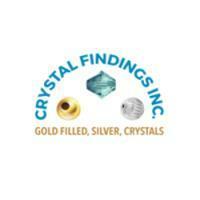 Company Name: Crystal Findings Inc.